Thailand’s tech and start-up space is getting hotter everyday. The conference hall was full of attendees, and there were no empty seats. This was the E27′s second event in Thailand this year. Japanese VCs and giants wanted to confirm their roles in SEA, especially in Thailand with at least three investment firms. Global Brain held a pitch up session with 10 startups. Cyber Agent Ventures just closed a deal with a Thai eCommerce start-up. Will see this news soon on some Asia tech news sites. Indonesian VCs have kept an eye on Thailand’s market with Aryo Ariotedjo from PT Grupara. Currently, Korean VCs are not interested in Southeast Asia’s start-ups. Daniel Kang from SoftBank Ventures Korea shared with me: “You see, here are no Korean guys but me.” BeSUCCESS is busy organizing some events in the US with the theme “bringing Seoul to the Valley,” although it’s not so active in SEA. Two Thai companies asked me to help them find Vietnamese mobile developers to work in BKK. One Thai company is looking for a local strategy partner to promote their social media management tool in Vietnam. Two other Thai VCs want to know more about eCommerce start-ups in Vietnam. A mobile entrepreneur from Taiwan came there just to look for VCs, as it’s hard for him to find investors in his hometown. And you, do you see any tech trend in your country now? 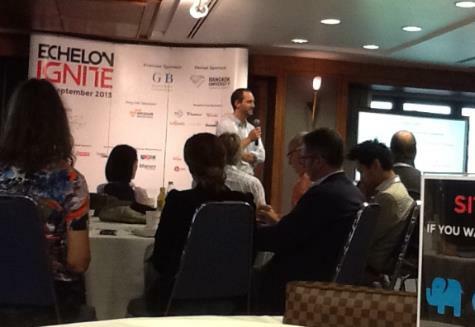 Venturra Capital’s Partner Tee Suraphongchai: We don’t mind start-ups that are “over the moon”! Echelon 2017’s Winner: ex-Amazon guys – cofounders of Healthy Food Delivery app IndieDish!